The last five years have been busy ones for Leslie Durschinger, Mike Korchinsky, and hundreds of others "green entrepreneurs" scouring the planet for endangered or degraded forests to conserve. It's a daunting task, because their conservation plans will only work under certain precise conditions. To begin with, the forests must face a threat that's clear, quantifiable, and containable, while that threat must be the kind that responds to certain prescribed solutions. Moreover, those solutions must account for "leakage" - which is what happens when you save a patch of forest in one place only to see the same activity move someplace else. It's all part of a global experiment to see if "pay-for-performance" conservation works. The answer, increasingly, is: "Yes, it does" - to the tune of 26.5 million hectares of forest under protection as of last year, according to the Forest Trends Ecosystem Marketplace report Covering New Ground: State of the Forest Carbon Markets 2013. That's more than all the forests of the Democratic Republic of Congo combined, and a clear signal for policymakers who will be looking for climate-change solutions at year-end talks in Warsaw over the next two weeks. on land they are protecting with the help of REDD offsets. Five years ago, Durschinger found her ideal forest in the Cambodian province of Oddar Meanchey, where new migrants and soldiers were chopping down scattered bits of forestland in a pattern called "mosaic deforestation". It's an all-too-familiar phenomenon across Asia and parts of Africa, but Durschinger knew she could slash the damage by implementing sustainable forestry and agriculture practices. That, however, would require expensive training, monitoring, and analysis - and success would hinge on finding the right local partners. Fortunately, Oddar Meanchey has those partners in spades. 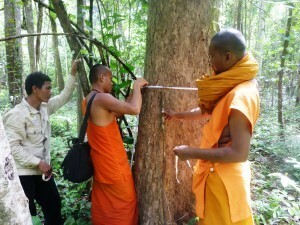 It's home to Buddhist Monks who are keen to protect the forest, and it's governed by a progressive yet cash-strapped Forestry Ministry that's open to innovative solutions that can be scaled up if successful. Together, she and the monks and the ministry launched a community-based management program that will end up conserving more than 50,000 hectares of forest - even after accounting for leakage. That will prevent the release of more than 8 million tons of carbon dioxide into the atmosphere, and that reduction will generate the income that makes the conservation possible. Korchinsky, meanwhile, had been working with impoverished farmers who were chopping trees out of desperation in Kenya's Kasigau Corridor. Recognizing the economic drivers of this deforestation, he teamed up with Chief Pascal Kizaka to develop alternate sources of income and take the pressure off the forest. Together, Korchinsky and Kizaka are now protecting a massive 500,000 hectares of valuable dryland forest. Over the next 30 years, their project is slated to prevent the release of more than 30 million tons of carbon dioxide and put hundreds of thousands of locals to work. These are just two of the 168 carbon-based conservation projects that the State of Forest Carbon Markets report identified. The projects are scattered across 58 countries and are slated to reduce carbon dioxide emissions by 1.4 billion tons over the next five years - reductions that will only take place if buyers step up to support efforts already underway. Otherwise, much of the progress achieved to-date will be lost. On the other hand, these numbers can be ratcheted up substantially if policymakers step up with national-level accounting and programs that incorporate existing efforts in a framework that can handle deforestation on the scale needed. Most of the projects in the pipeline are "REDD" projects, which work by saving endangered forest (The acronym stands for "reduced emissions from deforestation and degradation"). Others are "REDD+" projects, which also promote climate-friendly agriculture, improved forest management (IFM), and other activities that result in more carbon being locked in trees. Still others are "A/R" programs that plant trees (the acronym stands for "afforestation/reforestation"). Virtually all of the activity documented in the report took place in the voluntary markets, while most media coverage of carbon trading has focused on the European Union's top-down Emissions Trading Scheme (EU ETS) that was initiated to handle credits and offsets generated under the United Nations Framework Convention on Climate Change (UNFCCC). While generally perceived as being a UN-initiated solution, all things forest carbon were marginalized under the UNFCCC, while REDD wasn't recognized at all. Over the next two weeks, however, negotiators will look to lessons learned in the voluntary markets while looking for ways to integrate REDD into the UNFCCC - for only with that integration can REDD achieve the kind of scale necessary to really make a difference on a global scale. Encouragingly, companies most directly impacted by forest risk are also the ones most likely to support REDD. Indeed, the three biggest buying sectors are comapnies in the energy, agriculture/forestry, and transportation fields. These are the three sectors with the greatest exposure to changes in natural infrastructure, and they are investing in part because they see REDD as a risk-management tool. "This report demonstrates what industry first-movers already know, that financing forests' conservation and sustainable management is not just about license to do business, or image," says Forest Trends President and CEO Michael Jenkins. "It can directly benefit companies' infrastructure, suppliers, and bottom lines." Next in line are consumer-facing companies like Disney and Microsoft, which are using the offsets in part for their image, but also as part of an internal carbon offsetting process designed to green their supply chains. For now, there's plenty of reason for optimism. The Ecosystem Marketplace survey found that prices for forest carbon offsets averaged $7.80 per ton last year, which is about ten times the closing price of Certified Emission Reductions (CERs) trading under EU ETS. If you take the highest-priced forest-carbon offsets and compare them to the lowest-priced CERs, you'll find that companies are often paying hundreds of times as much to get forestry offsets as they would for others. That's a powerful signal, because it means companies are willing to pay extra for offsets that not only reduce emissions but also protect the rainforest and support sustainable livelihoods for people around the world. That's a message we can only hope isn't lost on policymakers. Ecosystem Marketplace is a news service focused on identifying workable solutions to sticky environmental challenges, and the Skoll Foundation recently invited our parent organization, Forest Trends, to join the Social Entrepreneurs' Challenge. This blog is part of that challenge. If you like what you're reading and would like to see more, click here to help us to keep the information flowing.